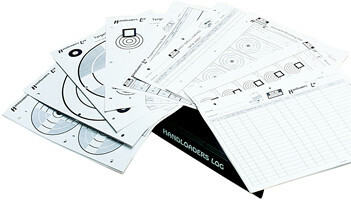 Whether you shoot rifles, pistols, or shotguns, the Handloaders Log is the organized shooter's dream. With a total of 150 pages, space is provided for recording extremely detailed data. For example, you can keep track of your ammunition performance, pet loads for different firearms, shotshell loading data, firearms inventory, and the list goes on. Also, the large assortment of targets provided helps you quickly analyze your reloads. 299 targets are included and is an absolute must for the serious reloader.